A sea lion basks in the sun. 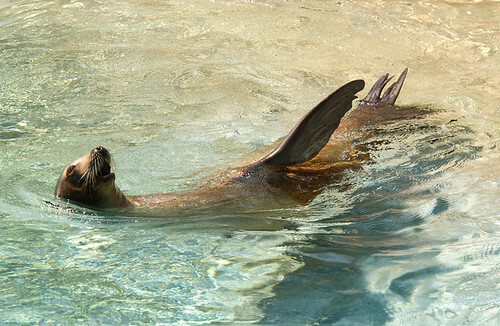 Sea lions are regulated animals under the Animal Welfare Act. Many people know that the Animal and Plant Health Inspection Service (APHIS) is the agency tasked with administering the Animal Welfare Act (AWA). But did you know that this is the 50th anniversary of that Act? In 1965, a Dalmatian named Pepper was stolen from her backyard by a dealer, who then sold her to a hospital. Pepper was used in research and subsequently died. The public outcry was, understandably, enormous, including coverage in several major magazines. As a result, Congress passed the Laboratory Animal Welfare Act – the precursor to the AWA – in 1966, and tasked the U.S. Department of Agriculture to ensure the health and wellness of animals used in research. Although the AWA has been updated and modified many times since 1966, its goals remain the same – ensuring the health and wellness of regulated animals. Congress amended the AWA to refine the standards of care for regulated animals and add provisions to cover animals used for commercial breeding, for public exhibition, and those transported commercially. The AWA also prohibits animal fighting, with stiff penalties for anyone who owns fighting animals or sponsors/promotes the events. And while the AWA doesn’t regulate private pets, we do help out in natural disasters. When Hurricane Katrina hit Louisiana, many pet owners wouldn’t leave without their pets, resulting in tragic consequences. Right on the heels of Katrina, Hurricane Rita also slammed into Louisiana. Employees from APHIS rushed to save approximately 14,000 pets. Since then, we’ve created an Emergency Programs division to work with FEMA and other organizations to help develop plans and training specifically for disaster-related animal issues. We know that it’s incredibly important for individuals involved in AWA-covered activities to understand the law and its requirements, so we opened the Center for Animal Welfare in 2010. The center provides science-based guidance and learning opportunities for our employees and our stakeholders. They consistently share information with the animal welfare community through meetings and other types of outreach. While a lot has been accomplished in 50 years, we couldn’t have done it without our dedicated team of animal care employees who are resilient, resourceful and responsive to the humane needs and welfare of animals, and the support of our stakeholders and the public. Our work is not done. We will continue to seek ways to refine the AWA’s protections to ensure the health and wellness of all regulated animals. We look forward to working together with our stakeholders and the public to ensure the next 50 years are as productive as the previous ones. Sounds great, anything that can be done to take care of animals should be practiced. Now work on the issue with horse slaughter and end the shipment of horses across our borders. Horse slaughter is not a humane ending to a horses life.